As teacher, broadcaster, author (The New Music, published in 1924, was a landmark in twentieth-century English criticism), administrator and public figure, Sir George Dyson played an influential role in British musical life for nearly fifty years. He was a Yorkshireman of working-class origin who owed none of his success to birth or influence. He won a scholarship to the Royal College of Music in London where he studied with Stanford and responded wholeheartedly to Parry. During the Great War his Manual of Grenade-Fighting was officially adopted by the War Office. (It was typical of his exceptionally keen and resilient mind that whatever circumstances forced him into doing he did well, even if it was killing Germans.) After the war he resumed his career of public-schoolmaster; his last and happiest appointment was at Winchester (1924-1937), the city which he came to regard as his spiritual home and whither he retired after completing fourteen years as the Director of the Royal College of Music. It was at Winchester that most of his best music was written, including the works on this compact disc. If told that a man who led such a life also composed in his spare time, we would probably, one suspects, be only too ready to decry his music as ‘academic’. In Dyson’s case we would only have to listen to a few bars of Hierusalem to find our expectations confounded. There is little ‘academic’ (in the usual, pejorative sense) here. The prevailing temper is lyrical, even romantic; the scoring (for both voices and instruments) not merely competent but masterly; there is a dramatic streak; a sense of colour, of fitness of sound, of beauty of sound: Dyson is a poet, not a pedant (he disliked pretentious solemnities of all kinds, within music and without) and clearly a lover of the good things in life. He is also a professional. What language does he speak? English, no mistake. Imagine an idiom founded on Parry and Stanford which bypasses Elgar, lends a more willing ear to Vaughan Williams’s modality and finds even more of interest in Delius’s harmonic colours, his orchestral poetry-in-sound, and in Strauss’s richness of texture; mix all these ingredients – and they blend well – and the result is more-or-less Dyson. It may be traditional fare, but the taste is good and it digests well. Dyson was a composer of a wider range than that embraced by his musical portrait-gallery after Chaucer, The Canterbury Pilgrims, the work by which he’s chiefly remembered. As long as we are unfamiliar with such major scores as The Blacksmiths, St Paul’s Voyage to Melita, Nebuchadnezzar and the gigantic two-part oratorio Quo Vadis – which contains some glorious music – much of the most interesting part of the picture is missing. The Symphony and Violin Concerto, the Concerto da Chiesa and Concerto da Camera (both for strings) are also fine works and as unaccountably neglected as much else of that English vintage. 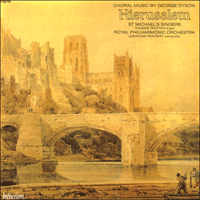 The Three Choral Hymns and Three Songs of Praise both date from the 1930s and Dyson’s first Winchester period. Here the idiom might loosely be defined as ‘festival English’, since the composer is clearly intent on meeting the need of the school- and amateur choirs with which he was much involved at the time. But even when working within the bounds of a fairly narrow diatonic convention Dyson contrives many an imaginative touch: for instance, the modulation from stanza 1 to 2 of George Herbert’s ‘Praise’ (is it exhilarating or just plain vulgar?) and the way in which the even-motioned crotchet tread, with its lack of rhythmic variety, is perfectly adjusted to the text of Dr Watts’s ‘Morning and Evening’, concerned as it is with the inevitable unfolding of the daily routine. (The same applies to the simplicity and matter-of-factness of Herrick’s ‘A Poet’s Hymn’: and note the unbombastic grandeur of the peroration. Dyson learnt much from Parry about constructing broad and sonorous choral climaxes.) The setting of George Gascoigne’s ‘Lauds’ is one of Dyson’s loveliest, masterly in its encompassing, within a sustained mood of calm, of the progress from night-in-sleep to the encroaching brightness of sunrise. And where, one wonders, did Dyson find William Habington’s gem-like ‘Hymn to the Stars’? The music of ‘For the bright firmament ...’ sounds a note of exalted but unaffected mysticism which links it not only with Hierusalem but also with his basically simple, unpretentious and eminently listenable-to composer’s spiritual will-and-testament, Quo Vadis. Written in 1960, the Fantasia and Ground Bass for organ is a product of Dyson’s Indian Summer – a beautifully-made piece of happy invention, melodious and unportentous in character. Although Dyson’s career started in the organ-loft when he was a boy, only in the last decade of his life did he start to compose for the organ; in this he curiously resembles Parry.